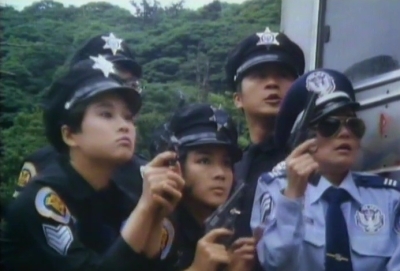 Although Taiwan clearly would take cues for its own productions from Hong Kong's The Inspectors Wears Skirts, a year before its imagery and title suggests Chu Yen-Ping (Island Of Fire) and Eric Tsang were keeping an eye on the 'Police Academy' series (who were four entries in, latest being 'Citizens On Patrol'). Not high, comedic art to begin with, at least some makers showed up to make a difference even in the 4th of said series. No such effort in Naughty Cadets On Patrol. To solve the problem of overcrowded jails and an understaffed police force, minor offenders are let out and let into police academy training. Cue the training sequences and a tacked on robbery-scenario at the end. One doesn't expect every comedy to set the world on fire or to reinvent the wheel and Chu has proven to be a reliable filmmaker for frantic, broad humour on screen. But it's like when he or any Taiwanese filmmakers portray their police force or army on screen, it's ok to be very lazy. Introducing our character types as they step off the bus such as tough guys, fast talkers, nerds, beauties and a strict leader to whip them into shape, structure is all fine if we found ourselves able to connect with... anything. This is in other words not a movie remembered for its sharp, comedic banter or for the chemistry between actors. Sure, they were probably amused by their shared antics on set but such fun doesn't travel to us. Cranking banter and comedic situations to the point where the movie seems unexpectedly fast paced, this is in fact Chu Yen-Ping deadly afraid of letting the movie be silent in case we realize we're watching clueless bufoonery trying to be filmmaking. General audience friendly skits such as characters reacting so violently they fall out of bed, birds pooping on heads, sound effect enhanced punchlines, some day a movie is going to come along that can rely on a sketch structure with a tacked on plot. This isn't the movie or the day. 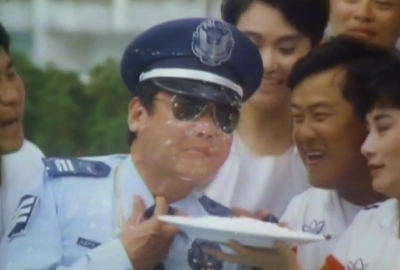 Naughty Cadets On Patrol realizes way too late that if you make the characters and situations ludicrous to a surreal level, comedy might just work and the exam-sequence involving Eric Tsang and a fake cast is a successful example. Because here Chu just drops logic and has characters cheating openly and loudly plus later we get a peeper who carries that badge with pride. Rare occurrences of inspiration but at least Police Academy didn't end with some of our heroes (whoever they are) being gunned down. It's certainly the unique Asian twist on matters. A few minutes worth of unique twists.